Here I am on the Riva di Ca' di Dio in Venice visiting the 53rd International Art Exhibition. The black shirt and the tie entitle me to comment on the artworks with authority. 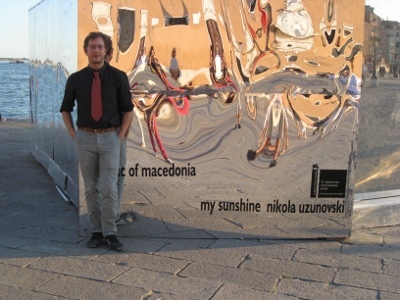 The shiny cube I'm leaning on is a showcase for Nikola Uzunovski's My Sunshine project. Nikola, an applied artist, wants to improve the quality of life at northern latitudes (or deep mountain valleys). The problem with these places is that, although they may well be wonderful in all other respects, they get light for a rather short time in winter. In the best of cases, lack of sunlight makes you a bit sleepy, in the worst case it makes you clinically depressed. Nikola's solution is a device that lengthens the day: a mirror that floats up in the sky, electronically controlled to shine the sun's image on an otherwise dark spot on earth. How does it work? Simply, the device exploits the fact that up in the sky the day lasts longer than at the earth's surface – as shown in the diagram at left (please do not blame Nikola for that). The mirror, floating inside a helium filled balloon, reflects 90% of the afternoon rays onto the earth below creating a virtual sun. My sunshine is a step toward bringing Italian climate to Swedish civilization – the Eden of humanity. Bringing Swedish civilization to Italian climate, unfortunately, remains a daunting challenge for artists and scientists alike.